Hoverboards Put On No-Fly List, As Airlines Cite Fire Concerns : The Two-Way The bans come as the U.S. Consumer Product Safety Commission says it's looking into at least 10 reports of the self-balancing electric scooters bursting in flames. Hoverboards like the one seen here won't be allowed on flights by America's top three airlines, which are citing a potential fire hazard related to the self-balancing scooters' powerful lithium-ion batteries. Citing a potential fire hazard, major U.S. airlines are banning hoverboards from their cabins and cargo holds. Announcing its ban, Delta acknowledged the toy's "presence on many gift lists this holiday season" but said safety comes first. The bans come as the U.S. Consumer Product Safety Commission says it's looking into at least 10 reports of the self-balancing electric scooters bursting in flames — an occurrence that's allegedly been captured on video, in some cases. "The three biggest airlines in the country are banning hoverboards on their flights. "On Thursday, Atlanta-based Delta Air Lines released a statement saying the motorized scooters are no longer allowed in carry-on or checked luggage. "United Airlines and American Airlines did the same; United's ban is already in effect, while American's ban starts Saturday." Saying that it's aware of hoverboards' growing popularity, the CPSC tells NBC News that it's working to investigate a range of sample products "as quickly as possible." 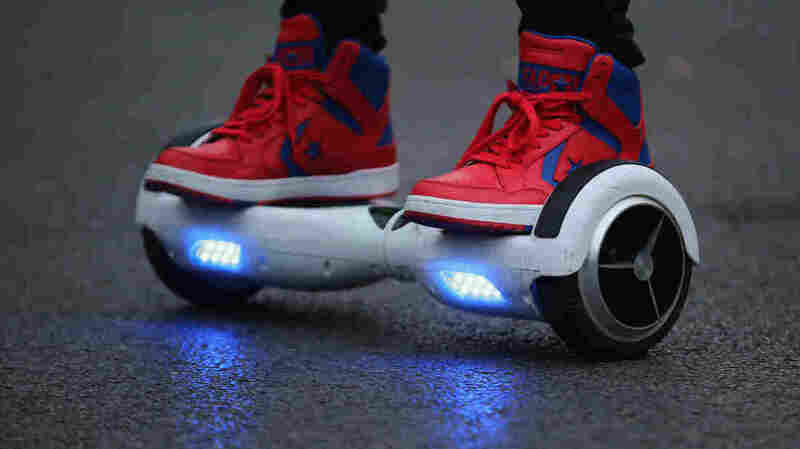 A spokesman tells Gizmodo that the agency is also looking into numerous reports of people being sent to the emergency room after falling off hoverboards. On Thursday, online retailer Overstock.com said it would no longer sell the toy, citing "the continued emergence of news reports highlighting safety concerns." Announcing its ban, Delta says that part of the airlines' problem with the self-balancing devices is that they're not labeled consistently – particularly when it comes to the power capacity of their lithium-ion batteries. The airline notes that federal regulations place a 160 watt-hour limit on such batteries; the Federal Aviation Administration notes that the limit is large enough for the largest laptop and pro audio/visual equipment.